Last week, George E.B. 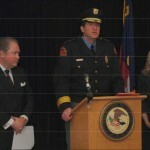 Holding, United States Attorney for the Eastern District of North Carolina, held a press conference at the Sanford Federal Building in downtown Raleigh to announce the federal government’s continued commitment to reducing violent crime and gang-related activity in eastern North Carolina. Much of the attention was focused on several neighborhoods in Raleigh, where the Raleigh Police Department continues to work in conjunction with the U.S. Attorney’s Office and other federal officials to charge and prosecute offenders federally, where appropriate. At the press conference, Raleigh Police Chief Harry P. Dolan expressed his appreciation to the U.S. Attorney’s Office, RPD officers and detectives, and members of the community for the working relationship that made the arrest and prosecution of these offenders possible. Dolan also described the work being done by RPD and other Raleigh city departments to deliver community-oriented government services in an effort to help keep young people out of gangs and on the path officials to take a tougher stand against violent and gang-related crime in Raleigh. Shop, Save and Dine. . . and Help Alliance Medical Ministry! Enjoy dinner out with friends or family and save on early holiday shopping, all while also helping Alliance Medical Ministry!! A few North Hills merchants are offering shopping/dining discounts or a percentage of sales back to AMM for shoppers/diners who present the attached flyer at the time of purchase. The shopping days are Tuesday, Wednesday and Thursday of this coming week – November 17, 18 and 19. See the flyer for more specific details. This is a great opportunity to get into the holiday spirit and help our neighbors in need. Please forward the flyer to your friends so they can save and Alliance can help the working uninsured. The flyer can also be printed from our blog on our website. Posted in Uncategorized | Comments Off on Shop, Save and Dine. . . and Help Alliance Medical Ministry! Planning Commission to discuss Z-18-09 on Dec. 1st. The City of Raleigh Planning Commission’s Committee of the Whole will discuss case Z-18-09 (the convenience store property at Poole Road and Norwood) on Tuesday, December 1st at 9 AM in the City Council chambers. The purpose of this action was to provide the case applicant additional opportunity to confer with interested parties, toward the possibility of crafting new conditions aimed at mitigating concerns expressed at the public hearing and Planning Commission meeting. See the Committee of the Whole agenda here. Posted in East CAC, Event, Meeting | Comments Off on Planning Commission to discuss Z-18-09 on Dec. 1st. Mark Turner welcomed the attendees to the meeting at 7:07 p.m.
October 25 there will be a cyclocross event at Lions Park. A kids’ ride will be part of the event. The East CAC will meet Monday, November 16th at 7 PM in Lions Park Community Center, 516 Dennis Avenue. This month we’ll hear from David Thompson from the City of Raleigh’s Transportation Services department, who will fill us in on traffic calming measures that neighborhoods might pursue. We’ll also hear from our OPED committee on revised conditions for Z-18-09, the convenience store property at the corner of Poole Road and Norwood. (The OPED committee will meet at 6:30 PM, before the main meeting). Last but not least, we’re having our holiday social! We’ll be featuring delicious Buffalo wings from MoJoe’s Burger Joint and pizza from Frank’s Pizza! Come on out, bring a friend, and get to know your East CAC neighbors!